In the book Outliers, author Malcolm Gladwell says that it takes roughly ten thousand hours of practice to achieve mastery in a field. With that premise in mind, Carole Fanning is most definitely a master in yarn crafting. 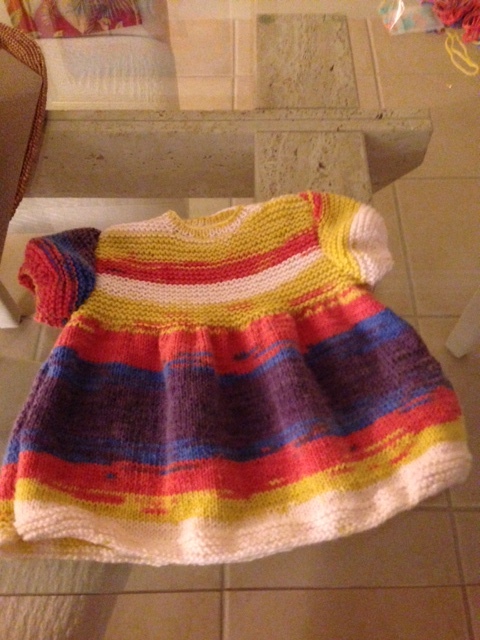 Nearly half a century ago, when Carole was expecting her first child, her husband suggested she take up knitting. “Isn’t that what pregnant women are supposed to do?” he queried. And the rest is history. Carole immersed herself in books and magazines, promptly teaching herself how to knit. Soon after, she went rogue and instead of following patterns to a tee, she deftly figured out how to do things her way, improving on every project she took on. Some years later she taught herself crochet and has participated in and led a myriad of knit and crochet groups along the way. 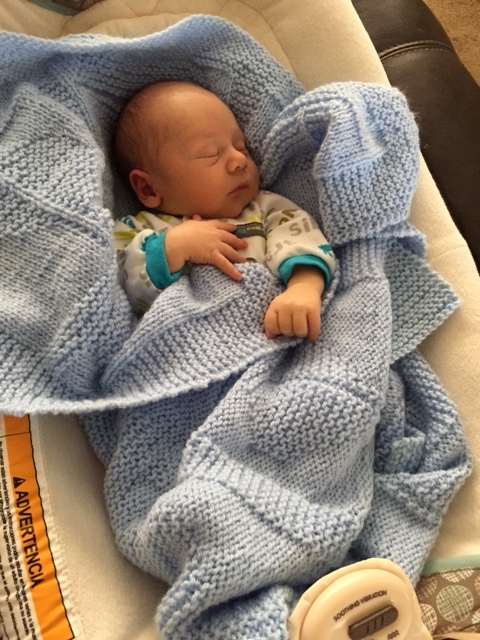 Carole created the pattern and knitted this beautiful baby blanket. Fast forward to today, Carole lives in the Georgia mountains where she teaches knitting and crochet, bakes world-class wedding cakes, makes filet crochet lace-enhanced porcelain figurines and much more. “I love to make things,” she explains. Always a leader, Carole shares a story of a favorite yarn shop that had to shut down, leaving her yarn crafter group “homeless.” Instead of giving up, Carole went to the coffee shop down the street and asked if they could open on Mondays, a day when they were usually closed, if she promised to bring a bevy of crafty women who craved coffee and treats during their sessions. The group was back in business in no time. 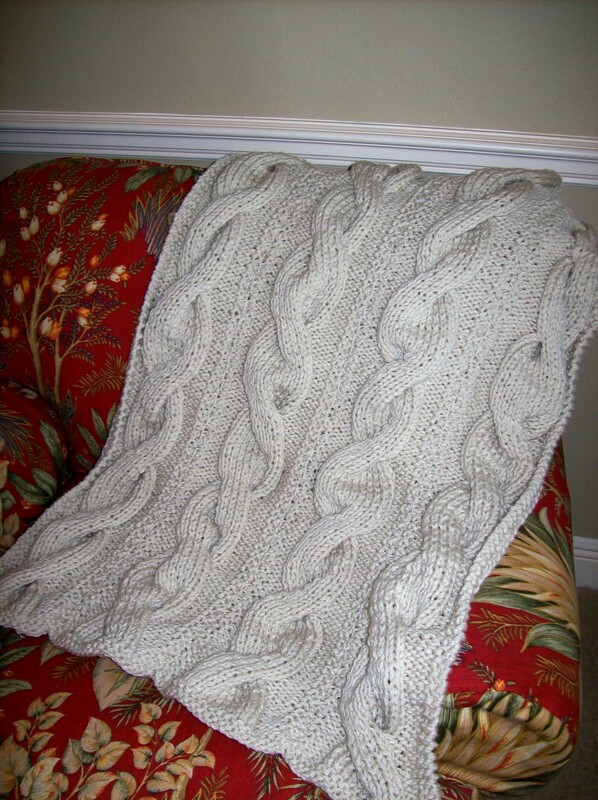 Carole’s knit and crochet projects are beautifully crafted, heirloom quality and truly treasured by the recipients of her gifts. One sweet example is a collection of layette sets she made for triplet girls, color appropriate for their names: Violet, Rose and Ivy. So treasured were these outfits by the family that although the girls have long grown out of them, they now adorn three prominently displayed Cabbage Patch dolls. 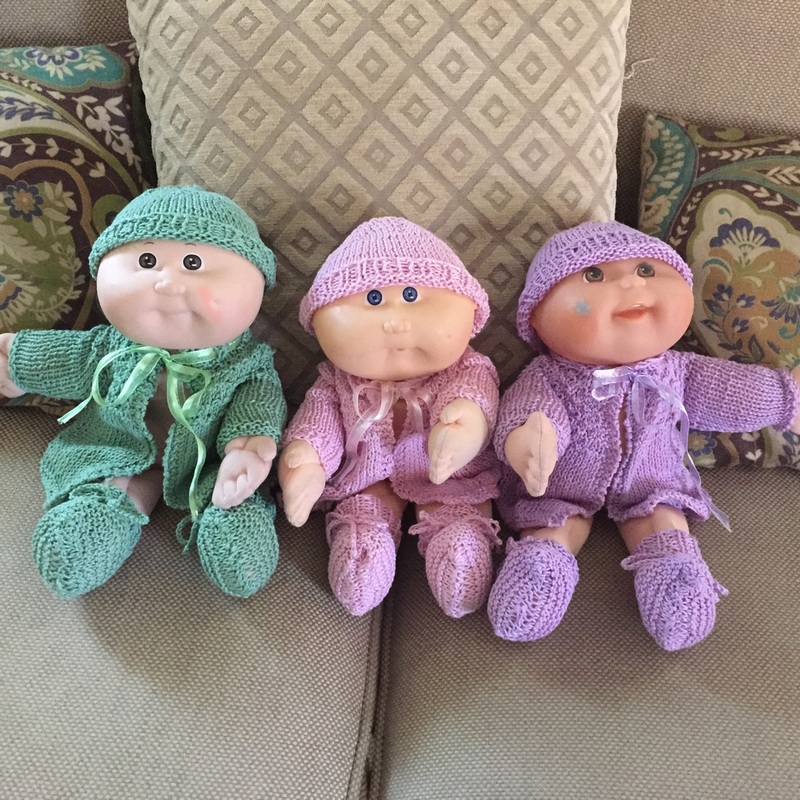 Originally knitted for triplets Ivy, Rose and Violet, Carole’s beautiful creations now adorn the girls’ collectible dolls. Carole adores her complete collection of Laurel Hill wooden hooks in their “gorgeous” case. She exclaims that after discovering Laurel Hill at an Atlanta yarn show more than five years ago, Carole says she will never go back to metal. What’s next for Carole? She has numerous projects in the works and dozens of students who depend on her generous advice. Carole embraces her role as a mentor and is the epitome of #StitchItForward to continue her yarn crafting legacy. Those with arthritis or joint or muscle pain in their hands will welcome these beautiful knitting needles from Laurel Hill. With the strength of birch wood and the beauty of rosewood, Symfonie Rose Cubic needles are highlighted by sharp points and an easy-to-hold shape. As a result of their unique design, Symfonie Rose needles are included in Laurel Hill’s selection of arthritis-friendly fiber arts tools. Made by hand, the Symfonie wood needles reflect the same quality as Laurel Hill’s vast selection of knitting needles and crochet hooks. Because these needles are resistant to water absorption, they cannot warp and remain straight and strong for years of use. Have you tried these or any of Laurel Hill’s other fiber arts tools? Please let us know what you think! More soon!